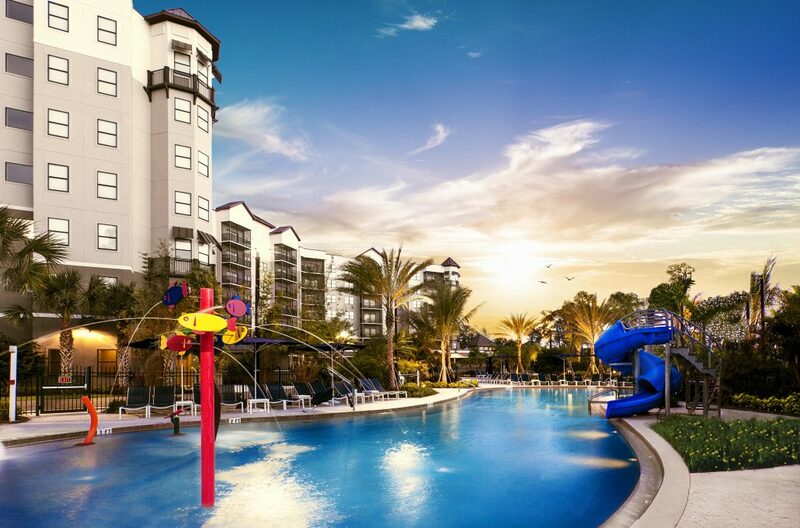 The Grove Resort & Water Park, a luxury vacation home community minutes from Walt Disney World, has begun completion of the third tower in the sprawling 106-acre resort. The building will consist of 293 exquisitely designed and furnished residences scheduled to start sales in Summer 2019. The Grove offers families and real estate buyers the opportunity to own a vacation home in Orlando, home to some of the world’s most celebrated theme parks. The two- and three-bedroom residences come with an array of indoor and outdoor amenities. Completion of the project consists of finishing the interiors of the luxury two- and three-bedroom suites and the common areas in Tower III. Fort Lauderdale-based BTI Partners, a real estate investment and development firm, is the developer of the private enclave. When all the residences are completed, The Grove will consist of 878 luxury vacation homes four minutes from Walt Disney. The announcement comes as The Grove moves closer to selling out the 293 residences in the ‘Marquis Tower’, which opened in March 2018. The 292 residences in the ‘Premiere Tower’, which opened in early 2017, have already sold out. In over a year, BTI Partners has closed more than $120 million in sales. The short-term/hotel rental program is operated by Benchmark Hospitality, a top-ranked international hospitality management company of resorts, hotels and conference centers. The company’s two distinctive portfolios of hotel and resort properties, Benchmark Resorts & Hotels® and Gemstone Collection®, represent the finest in guest-dedicated hospitality. The vacation homes range from 1,250 square feet to 1,550 square feet and are priced from $310,000 to the mid $400,000’s. The residences include access to three swimming pools, an onsite spa, fitness center, high-end restaurant, large-scale grab-and-go market with seating, lakefront pier for watersports, three bars and lounges, and a children’s art and game room. The $20 million Surfari Water Park which opened in March 2018, offers an interactive water structure with multiple slides, a lazy river stretching nearly 700 feet, and a dual-rider surf simulator offering an adrenaline-rush for surfers of all ages and skill levels. “Having our own water park on site is not only a great amenity for hotel guests, but also it helps grow the value of the resort, which is significant to the owners of the vacation homes,” said Kevin Mays, BTI Partners’ Director of Development & Construction. Over the last several years, Orlando has emerged as one of Florida’s preferred destinations of foreign buyers, including from Brazil (13 percent of all foreign buyers in Orlando), Canada (12 percent), Venezuela (10 percent), UK (10 percent), China (7 percent), Colombia (4 percent), Mexico (2 percent) and Argentina (2 percent), according to the most recent report by the National Association of Realtors. Overall, the greater Orlando area accounted for 10.8 percent of Florida’s foreign buyers in 2017, second only to the greater Miami area. The largest group of foreign buyers in the Orlando area came from Latin America, with 37 percent, followed by European buyers, with 22 percent. The Grove is a direct reflection of that. Benchmark Resorts & Hotels® features the finest in preferred accommodations, exceptional food & beverage, recreation, and superior meeting facilities throughout the United States and the Caribbean. Renowned for enchanting destinations, incomparable service, and for creating unforgettable memory-making experiences, they are a signature portfolio of BENCHMARK®, a global hospitality company®, which has been a leading US-based hospitality management company for nearly 40 years. Many select Benchmark properties are certified by IACC, the association that represents the finest meeting venues and services globally, and many have also been recognized with the coveted Benchmark Conference Centers® certification of meeting excellence. www.benchmarkresortsandhotels.com. To become a fan on Facebook, visit http://www.facebook.com/BenchmarkResortsandHotels. Follow us on Twitter at www.twitter.com/BenchmarkHotels, on Instagram at www.instagram.com/benchmarkresortsandhotels, and on Pinterest at www.pinterest.com/benchmarkhotels.